If you think about your favorite Christmas movie, cherished holday moment or a song that always puts you in the spirit of the season, there's a very good chance that the movie, moment or song you are thinking of will include snow. Whether falling softly in front of the window, creating a shimmering blanket across the yard or coating everything from the roof to the branches of trees, snowflakes are a magical and integral part of Christmas memories -- even if you've never seen the real thing! No matter what kind of climate you live in this Christmas you can enhance your already winter white surroundings or paint a snow filled picture across your home and yard this holiday season with snowflake lights! 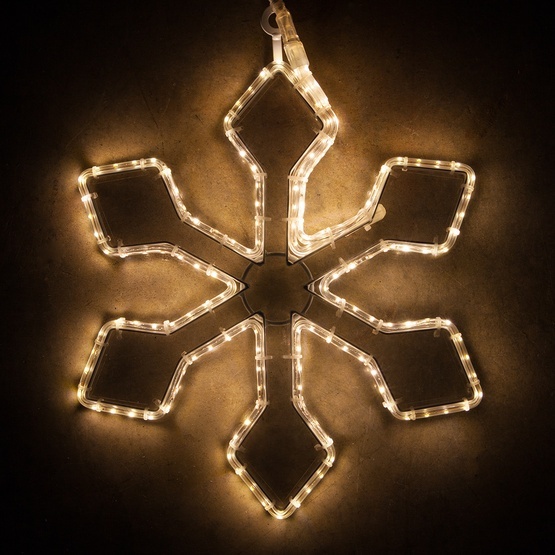 Snowflake Lights with Reflective Acrylic Centers - LED rope light wraps around the sturdy frame of these snowflake decorations and creates a beautiful shimmering effect as the light dances on its reflective acrylic center. Hang reflective center snowflake lights near other lighted Christmas decorations and watch as the reflected lights come alive. Reflective snowflakes measure 16" from tip to tip. 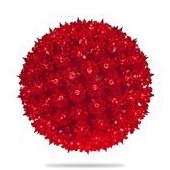 Dimensional Snowflakes- While many snowflake motifs lay flat, dimensional snowflake decorations can stand up on their own. A web of translucent acrylic fibers covers their sturdy metal frame and bright LED lights shine from within to create a multidimensional decoration that looks beautiful from any direction. Hang dimensional snowflake decorations from tree branches, stand them upright on the ground or place them on a table top or in a Christmas mantel display. Dimensional snowflake lights measure 24" from tip to tip. 2D Folding Snowflake Christmas Lights - Lack of storage space can be a real problem for many Christmas decorators so these bright snowflake lights aim to solve that problem by folding flat for convenient storage! Folding snowflakes feature bright LED mini lights set into their sturdy frames which range in size from 20"-36"
Rope Light Snowflakes - Snowflake shaped metal frames are wrapped with sturdy incandescent or LED rope light to create a beautiful and bright holiday decoration that can be hung or laid flat on top of a slanted roof. Rope light snowflakes are available in solid white and blue light colors as well as combinations of blue and white or warm white and cool white LED. Rope light snowflake decorations range in size from 12" - 48"
Snowflake Icicle Lights- Just like regular LED icicle lights but with snowflake accents added to the string to create a Christmas light perfect for your winter wonderland display! Hang snowflake icicle lights along the roof, across the porch and even down stair railings. Snowflake String Lights - LED snowflake string lights come in blue, warm white and a combination of blue and cool white on the same string. You can connect over 80 of these LED sets together to wrap trees and greenery or decorate the mantel, windows and the porch. 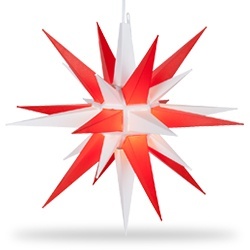 Snowflake lights are available in several incandescent and LED color options. 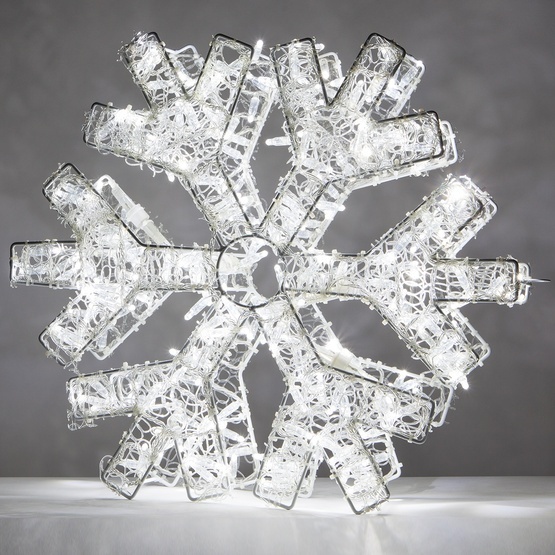 Clear incandescent and warm white LED snowflakes give off a cozy glow that is perfect for indoor and outdoor settings. Cool white LED snowflakes are a bright white color which works well outdoors and is a great complement to bold colors like green, blue and red. 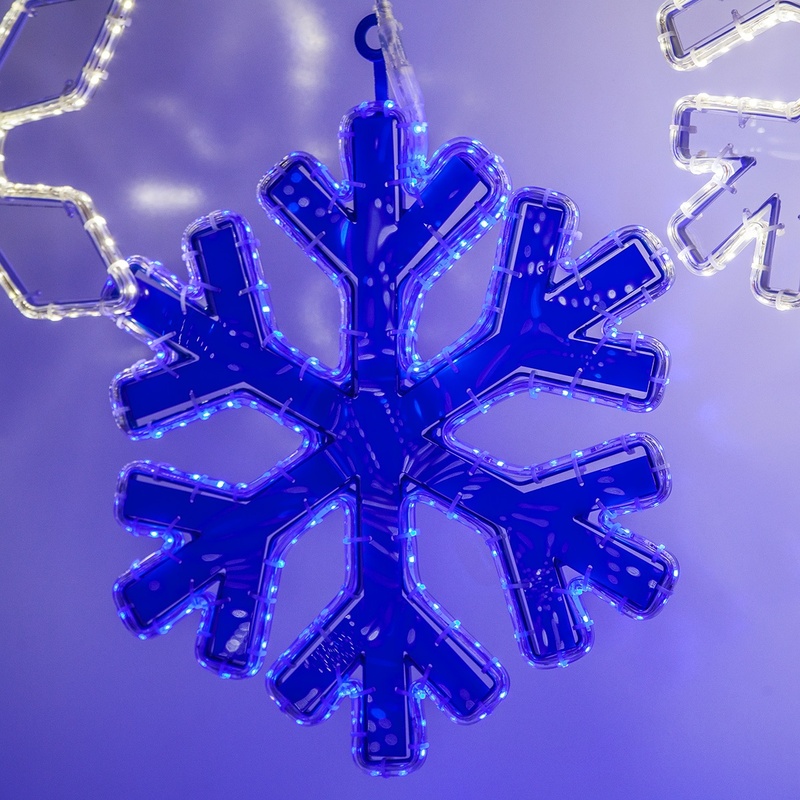 Blue LED and Incandescent snowflakes are also available and perfect for a winter wonderland themed display! In addition to solid color designs, there are a few color combinations available including snowflakes with blue and white lights as well as snowflakes with both warm and cool white LED lights. Many snowflake decorations will have a ring built into the frame to help with hanging them, others, like the folding snowflakes, have many open spots in their frame that could be used for hanging or mounting. To Hang snowflakes - tie or loop a rope or cord through the hanging ring or an open area of the frame. S hooks can also be used for hanging snowflakes. To Mount Snowflakes -Nails or hooks can be used for mounting snowflakes to a wall or flat surface. You could also use a temporary adhesive clip or hook to hang snowflakes on a wall or in a window. If your snowflake is large, several adhesive hooks may be necessary to support its weight. Snowflake Lights On The Roof - Depending on your roof style there may be multiple ways to attach decorations. 2D snowflakes can lay flat on a slanted roof. However, for more security, consider attaching your snowflake decorations to a rope or fishing line that is held in place on your roof between two sandbags. 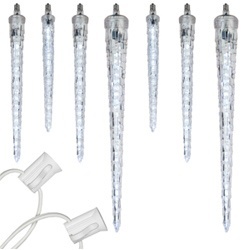 Icicle and String Lights - There are several types of light clips available to hang snowflake icicle and string lights from a variety of surfaces including shingles, gutters and even windows. Visit our light clips guide to find the right clip for your Christmas lights project. Step into a winter wonderland every time you arrive home with some of our favorite snowflake decorating ideas for inside and outside the house! Give Santa an easy way to spot your house this year by attaching snowflake decorations to the roof! Create a shimmering mantel display with snowflake lights and hang a lighted snowflake motif above the fireplace too! Hang a mixture of snowflake lights, star lights and Christmas light balls to create a dynamic and eye catching display from tree branches, above a front entry way or inside of an event space. Visit the pages below to find the perfect snowflake lights & decorations for your display or sign up for our email list to receive more decorating ideas, our latest DIY projects and special discounts!